Alpinestars has refreshed their Andes Drystar Jacket for 2017 with a renewed focus on styling and a solid handful of refinements to the jacket’s inner workings. At its core, the Andes is still a jacket for commuting, touring, and light adventure riding in 3-season cold weather conditions. You’ll still find removable insulation and non-removable waterproofing inside the jacket, but on the outside the styling is new with a bit more refined and streamlined look. The visual refinements also carry over to the physical refinements found in several features including new heavy-fabric overlays on the shoulder area, a simplified collar that’s both effective and comfortable, and some drastically improved chest venting that flows directly to the body past the waterproofing. 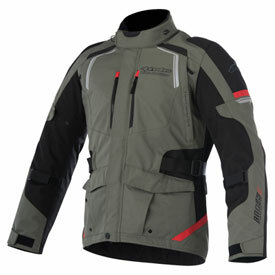 Overall, it’s the same reliable Andes Jacket with some extra punch that raises the bar even higher. And with such a versatile, waist-length cut and capable weatherproofing, the Andes Drystar can work for riders on a multitude of bikes from your GS series and KTM 1190s to sportier bikes like the Yamaha FJ or Ducati Multistrada. The first thing I noticed was how good it looked and how well it appeared to be built. I get lots of compliments on the jacket. The waterproof chest pocket. I haven't noticed any water getting into it, even in heavy rain at 60 mph. The fit is pretty good for my build (6'3" 200lbs) in a size large. And it has plenty of adjustability for layering. Not waterproof! The first few commutes in the rain I was noticing some rain getting in. I thought it was through the vents at first and tried making sure I had them zipped up all the way. Then one day I decided to go for a longer ride in the rain to put it through it's paces. I ended up getting wet on my chest, biceps, and thighs. Anywhere wind was hitting me, water was getting through. "The Andes V2 has a light external coating but is not a laminated jacket. After using this garment in heavy rain for extended amounts of time the outer shell can absorb water. The Drystar membrane is floating between the outer shell and internal liner which will keep all water from penetrating to the rider. However, this will effect the breathability of the Drystar membrane." This is just pathetic customer service since it's supposed to have a one year warranty and I got it this summer.